This week astronomers at Cal Tech announced that our solar system may in fact have nine planets after all, and no, it’s not about Pluto. Researchers Konstantin Batygin and Mike Brown at Cal Tech have found there is evidence of a ninth planet (planet IX) in our solar system. This planet’s existence was inferred from simulations run through mathematical modeling and computer simulations. The planet, if it is confirmed to actually exist, has a mass about 10 times that of Earth and orbits about 20 times farther from the sun on average than does Neptune (which orbits the sun at an average distance of 2.8 billion miles). So this thing would be pretty far out there. In fact, it would take this new planet between 10,000 and 20,000 years to make just one full orbit around the sun. I want to emphasize that no one has actually observed this object yet. It has only been inferred from models and simulations in an attempt to try and explain a number of mysterious features of the field of icy objects and debris beyond Neptune known as the Kuiper Belt. Apparently something weird was going on with the orbits of some KBOs or Kuiper belt objects. Six of the most distant KBO’s all follow elliptical orbits that point in the same direction in physical space which astronomers on the team found surprising because the outermost points of their orbits move around the solar system, and they travel at different rates. What’s more the orbits of the six objects are also all tilted in the same way—pointing about 30 degrees downward in the same direction relative to the plane of the eight known planets. The probability of that happening randomly is about 0.007 percent. So after eliminating other explanations like this effect being due to unseen and undiscovered KBOs in the area, the team plugged in some numbers assuming there was a planet nearby. They asked, what if there was a planet there? Would the gravitational influence of an unseen planet explain what they were seeing? That almost worked, but not quite so they tweaked things some more. They found that if they ran their simulations with a massive planet, just like before, but put it in an anti-aligned orbit—an orbit in which the planet’s closest approach to the sun, or perihelion, is 180° across from the perihelion of all the other objects and known planets—the distant Kuiper Belt objects in the simulation assumed the alignment that is actually observed. Talk about Just like Downtown, I want to re-emphasize that this planet has not actually been seen, although this is a pretty compelling case for the existence of a planet, it still needs to be confirmed. 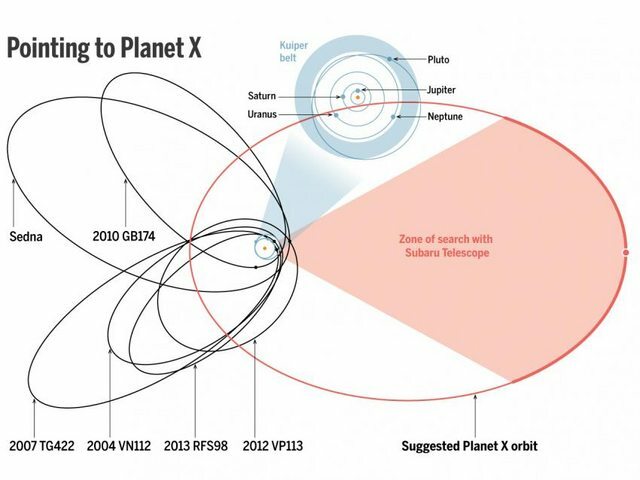 Planet Nine’s eccentric orbit. © JPL; BATYGIN AND BROWN/CALTECH; (DIAGRAM) A. CUADRA/SCIENCE. This isn’t our first rodeo when it comes to finding unseen planets though. Remember, Neptune was also predicted mathematically in 1846 before it was observed directly. Iregularities in the orbit of Uranus suggested a planet like Neptune was out there, and it turned out there was. And Pluto, while not an actual planet, was called Planet X for years before it was actually observed by Clyde Tombaugh. So while the team is continuing to refine their simulations, they released this paper this week to stimulate other astronomers and hopefully inspire them to start looking for the planet through their telescopes and confirm its existence through observations. I would encourage you to go to the blog that the astronomers in this study began — findplanetnine.com — to get a more complete picture of the story behind this currently theoretical planet. Konstantin has a good post on the process they used to determine whether there might be a planet there, and Mike has a post on whether the as yet unseen planet would be classified as a planet under IAU guidelines, so go check it out. Oh, and to all you NASA is hiding Nibiru from us conspiracy people: this is how you find an actual planet that may actually exist. And see? NASA’s not hiding it, as if it even could. I want to see it. I want to see what it looks like. I want to understand where it is, and I think this will help.